KDE fans must definitely watch out for openSUSE 11.4, which will be the first major Linux distribution to feature KDE’s Plasma Workspaces, Applications and Development Platform version 4.6. This trio of releases by the KDE community brings much better performance as well as many usability and feature improvements all over the place. Upgraders will feel a double dose of KDE goodness, as openSUSE 11.4 brings two major releases’ improvements over the KDE 4.4 shipped with openSUSE 11.3. The Plasma Desktop Workspace, which is openSUSE’s default graphical desktop, introduces several new features. First up is a more intuitive and smarter power management UI and a new Bluetooth stack which makes it easier to share files or use features of other Bluetooth devices such as headsets and mice . Plasma also introduces many improvements to the innovative ‘Activities’ management. Activities allow users to associate applications with tasks which can be saved, stopped and resumed at any time. For those with less screen estate to spend, the Plasma Netbook Workspace offers an experience more optimized for small screens. Plasma Netbook shows all your applications full-screen with a automatically hiding panel on the top of the screen offering a way to see all your windows as well as closing the current one, starting new applications and seeing the status of your battery or wifi connection. Plasma Netbook 4.6 has become more touch-friendly and much faster than the previous versions. Read more about these and other new Plasma Workspace features in the KDE Plasma 4.6 announcement. The KDE Applications 4.6 release introduces improvements like a new faceted search as well as non-indexed files search and support for git repositories in Dolphin, the file manager; social sharing of photos to sites like Flickr, Facebook and Picasaweb are now easy to reach from Gwenview, Digikam and KSnapshot. Â Developers will appreciate Kate’s new plugins for working with SQL and with GDB. KDE Games 4.6 marks the return of Klickety, also replacing KSame. Thanks to the KGameRenderer framework, KDE games take on a more consistent look and feel and perform better. Palapeli makes creating jigsaw puzzles out of your own images easier and Kajongg became easier and smarter. 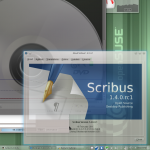 KDE PIM 4.6 is available in openSUSE as experimental feature. While openSUSE 11.4 ships with the more stable and more dependable KDE Kontact Suite 4.4.10, the latest and still experimental Akonadi based Kontact 4.6 is available for installation using this repository. Painting application Krita 2.3 has been designated by its developers as the first end-user ready version since 1.6. Their standards are high and they have been working with a variety of artist to make sure 2.3 is indeed fulfilling the needs of graphics ninjas. Krita 2.3 provides many new features, ranging from brush settings presets to canvas rotation, from warp transform to a new color selector — and of course many new brush engines. But the many improvements to stability, usability and especially performance probably make the biggest difference in everyday usage. Amarok 2.4.0 has a much faster collection scanner and can write statistics and covers directly to your audio files. Speaking of tags, there’s a new feature to work along with the rewritten collection scanner: Integration with the MusicBrainz music library to update your songs with accurate information. Having a well organized collection is easier than ever, now that you can select what you want tagged and do it with two clicks. Other notable features are improved iPod support (the Touch 3G should work great now), better transcoding support, Guitar and Bass tab information fetching, OPML export for Podcast subscriptions, an upcoming event applet and finally this release introduces support for UPnP. KOffice 2.3.1 brings improved performance, stability and usability in all applications. In the feature department, there is a new slide sorter view and a shape animations tool for KPresenter. OpenDocument support (especially text rendering) has been improved in all KOffice applications, as well as support for reading Microsoft file formats (doc, xls, ppt, docx, xlsx, pptx). KPlato and Kexi introduce a new report engine. openSUSE prides itself on being a prominent development platform for KDE applications and again offers the latest KDE Platform libraries and tools in openSUSE 11.4. Improvements brought by KDE Platform 4.6 include QML support in the Plasma framework, improvements to Nepomuk and a “Mobile Build Target” for those who want to build a thinner version of the KDE libraries. The toolkit KDE develops its applications and framework upon is Qt, a Nokia product. openSUSE ships the latest Qt 4.7.1 which introduces Qt Quick, the Qt UI Creation Kit. that enables the creation of dynamic user interfaces, easier and more effective than possible with existing UI technologies. With the help of IDE’s like Qt Creator and the powerful build tools like OBS openSUSE offers the best possible Linux software development environment in the Free Software world. With the latest KDE Plasma Netbook and Desktop Workspaces and the many updated KDE applications as well as the latest development tools and libraries, openSUSE 11.4 will offer a stellar experience for desktop users. openSUSE is the home of many KDE developers and contributors, which shows in the polished KDE products and the latest KDE updates which we make available for all supported openSUSE releases.Â Of course openSUSE ships the latest GNOME, XFCE and LXDE for those who prefer other desktops and we ship many different applications, all of which work perfectly well with the Plasma Workspaces as well as other desktops. Stay tuned for an article about one of those applications, LibreOffice, coming soon! I like the default wallpaper. It has a very professional look unlike the one in 11.3. I look forward to trying 11.4! Yup, I agree – there’s lots to like in this new release, but sometimes simple things make a big difference. The wallpaper and splash screen graphics in 11.4 really give the whole OS a nice, clean and professional look. Very impressed by the RC on my test laptop and looking forward to the installing the release on my work PCs. Install droid-sans and you will have a nice set of fonts for your desktop. Think this version of openSUSE brilliant! Great work! Unfortunately ugly fonts ruin this otherwise stellar distro. Just switch to another font doesn’t fix it. The subpixel rendering is patent inhibited, thus they refuse to fix it. I’m just not seeing the ugliness you are referring to from the screen shots above. To me, they look clearer and crisper than Ubuntu’s fonts (Which is look at daily). Ubuntu has this “Halo” around their fonts on my LCD screens and its somewhat irritating to continue to look at. I guess to each their own, though. re: subpixel rendering: for all i know, the patent on that expired sometime last year, and the libfreetype used in opensuse has been updated to that effect since then. I also can’t agree that fonts are ugly. To me they also look better than on Windows and any other Linux distro I tried (except maybe on Mandriva). To mee it all just looks perfect and I can’t wait for openSUSE 11.4. Great job all! all good for me, except one problem which is annoying since I need to use FTP server. I enabled pure-ftpd in xinetd, but I get 530 login authentication when I try to connect. I have been using suse from 10.3, but have only encountered this problem in 11.4, I thought it might be fixed in rc2, but seems that it’s still there. Also tried vsftpd, ended up the same way. Is there anything I can do to get around this? Running this from Factory, I love it. I’m running it from Factory too, and I too love it. No real problems at all, small annoyances, but thats it. To me this looks as one of the best openSUSE releases in years. This is surely lovely, it also boots and shuts down much faster. Since many KDE developers are in the house, is amarok not ready just yet? I failed to build a playlist with mp3 tracks. Otherwise thanks for the great work. It is very nice indeed, but I don’t like the colorless icons in the systray. I think they are boring, and besides that, if the icons have colors, like in 11.3, you can quicker find the one you need, for example, if I need to do something with bluetooth, I knew I had to look for the blue icon. Now I have to look for the right symbol, not very efficient. That’s funny. I was going to post the exact opposite about the systray icons. I understand your point that some color helps to differentiate between the icons but i feel that there is just too much color im the 11.3 icons and that they look a bit tacky. The new icons look much cleaner to me. KDE fans must definitely watch out for openSUSE 11.4, which will be the first major Linux distribution to feature KDEâ€™s Plasma Workspaces, Applications and Development Platform version 4.6. I think you have forgot about Linux Mint… Which is a major Linux distribution..!! Mint is based on Ubuntu, true. But it is still a major distro. I’ve yet to try 11.4, but I know that I had a lot of trouble on some machines with 11.3 and, to be quite honest, I still run 11.1 and 11.2 on the majority as a result. Actually, I was really impressed with 11.1 and as it now heads for its final hurrah, I need to compliment those that contributed to an excellent release. Yet again, however, my main concerns will be twofold; first, how easy will 11.4 be to set up on machines such as the Aspire One and the EeePC. While I’ve done these with previous versions as far back as 11.1, it still struck me that too much had to be done by hand. If 11.4 resolves that problem, I’ll be very happy. Second, and something I’ve commented on many times in the past, is KDE4. I used KDE3 on 11.1, 11.2 and 11.3 because KDE4 just didn’t come up to scratch in my view. More recently I have been forced to use KDE4 on Fedora 12 (not an enjoyable experience overall, to be brutally honest) and came up with the same niggles, mostly surrounding the demands it makes for resources when compared with its predecessor. Admittedly, the main machine that I ran 11.1 on to compare KDE releases on at first has now been superceded but I don’t appreciate the extra power being taken up by things that I don’t really need or want, hence the new machine is still running KDE3.5.10. Reading the above, however, would seem to indicate that such concerns are being addressed so it will be interesting to try the latest KDE4 out. That aside, hope it all goes well. I also stell use kde3.5 for 11.1. KDE4 don’t work well over nfs, it overload my station and my server. I hope this release solve this!!! Sorry to hear you’ve had some trouble, but I can’t second your opinion. I’m running 11.3 on my Asus EeePC 1005HA: the only trouble I’ve had is in choosing the desktop. I’ve run Plasma Netbook, Smeegol, and currently, LXDE. Everything always worked, its just been a matter of desktop preference. If you are referring to the required kludges needed to get everything working, especially the ones needed if you are running an SSD and so forth, it isn’t trouble as much as a bit of a nuisance. It’s especially awkward with an Aspire One as the notes provided are predominantly written for an Eee and are mostly connected with 11.1 so don’t always have the necessary updates for later versions though, in some cases, it’s because the kludge is no longer needed. I did get my Aspire to run 11.3 but the wireless networking side was broken and the mousepad wasn’t quite right either so I’ve dropped it back to 11.2 for now though I’ve got to check it over during the weekend as the racing season at Arena Essex kicks off on Sunday and I’ll need it there. My own desktop pref has always been KDE (the only exception is a version of Gentoo that is used in SystemRescueCD which uses XFCE but that’s purely for rescuing duffers, something which I have had surprisingly good results with when using openSUSE 10.3 Live CD! Go fig!) though as I said previously, I’ve not been impressed with KDE4 enough to give up KDE3.5 to date, even under 11.3.
cool, looks like Windows 7. 8 horas!!!!!!!!!!!!!!!!!!!!!! KDE o Gnome XD I want to give it a try. It’s cool! KDE and Amarok are just awesome. The most beautiful DE in the world. 11.4 is great. The only complaints I have are the stupid akonadi server that steals homedir space from me for mysql data files with no data in them. The equally horrible nepomuk garbage still starts even when it’s disabled in the .kde4/share/config/nepomukserverrc. There’s not much hope for this, since these are major design flaws in kde4.6. Lastly the Xserver crashes when loading the radeonhd driver with 3d acceleration enabled (the default and a reasonable expectation). I am such this one will be corrected shortly. The resource hoggery of kde4.6 will probably only get worse. 4.6 does seem faster than 4.4. What, no video capture and editor? WKhy not? I Installed opensuse 11.4 which was good but i couldn’t get some software for printer and scanner which i use regularly.